The Old Laundry shares a building with Bowness’ World of Beatrix Potter attraction. 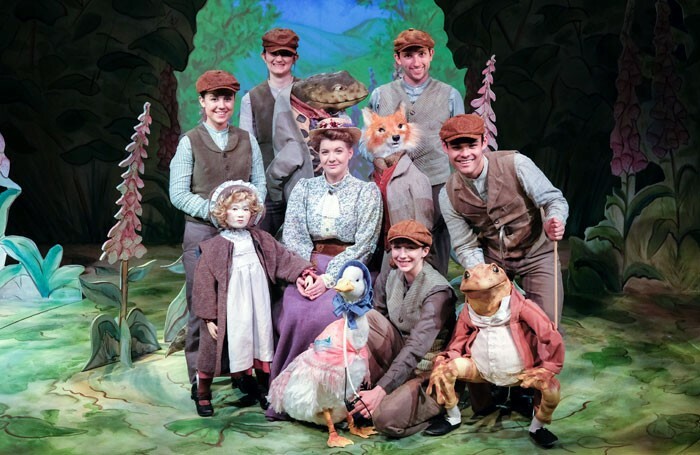 To mark the 150th anniversary of Potter’s birth, it has put together a musical adventure linking the tales of Jeremy Fisher, Mrs Tiggy-Winkle, Mr Tod, Jemima Puddle-Duck and Peter Rabbit. Roger Glossop’s set and Tim Reid’s video are faithful to Potter’s illustrative style. Her iconic characters, almost all in puppet form, are adroitly handled by a vocally and physically adept cast. Miriam Margolyes and Griff Rhys Jones’ voices are skilfully deployed to bring Potter’s words to life. Steven Edis and Alan Ayckbourn’s songs summon up a predominantly pastoral feel for Potter’s world – with the occasional lyrical reminder that some of its inhabitants may end up in a pie. The first half of the show is a little low-key. Puppets, much narrative, a strong musical element and fidelity to Potter’s originals leads to more atmosphere than action in places. In the latter stages, however, the production comes up with some ingenious ways to engage and excite. The energetic fight between Mr Tod and Tommy Brock is suggested by their effects on the stage furniture, which is semi-collapsed by the puppet handlers as the animals knock into it. At one point, not one but five Mr McGregors (played in masks) scuttle around the auditorium looking for Peter Rabbit. The cast is well marshalled by director/choreographer Sheila Carter, with some winning energy from Grace Eccle, Danielle Morris, and Molly Waters in particular.